The EL406 Combination Washer Dispenser offers fast, full plate washing along with three reagent dispensers in one, compact instrument… all from the recognized industry leader. 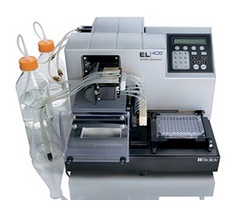 The EL406 is the latest advancement in 1536-, 384- and 96-well microplate washing and dispensing incorporating BioTek’s patented Dual-Action™ manifold, optimized washing for loosely adherent cell monolayers, built-in patented Ultrasonic Advantage™ for unattended wash manifold maintenance and up to four wash buffers for complex wash routines. BioTek’s EL406 magnetic bead washing module offers high strength biomagnetic separation in both 384- and 96-well microplates. Based upon what is regarded as the industry standard in microplate washing, BioTek’s EL406™ Microplate Washer Dispenser offers full plate washing of magnetic microspheres used in a growing number of multiplex assays and bead-based ELISAs along with reagent dispensing. Developed in conjunction with leaders in genotyping, gene expression and protein assays built upon the Luminex® xMAP® platform, BioTek’s magnets incorporate high-energy neodymium iron boron magnets for rapid separation of micrometer and nanometer beads with superior retention. An accessory magnet adapter kit allows any EL406 configuration to accommodate magnetic bead assay washing and dispensing. An available vacuum filtration module makes the EL406 also well suited for polystyrene bead assays and filtration-to-waste processes. The EL406 Washer Dispenser is Luminex® xMAP® approved. Up until now scientists had to choose their microplate dispenser technology - usually between either a peristaltic or syringe pump. Each of these technologies has its unique advantages. The EL406 eliminates the need to choose, offering both dispenser technologies on a single platform plus microplate washing. Now you can simply press a button and walk away. Automate an entire process by adding a BioStack™ Microplate Stacker. Unique Parallel Dispense capability: Dispense multiple reagents without carryover.